I have another holiday treat you will absolutely love! Snickerdoodle Cheesecake Bars. 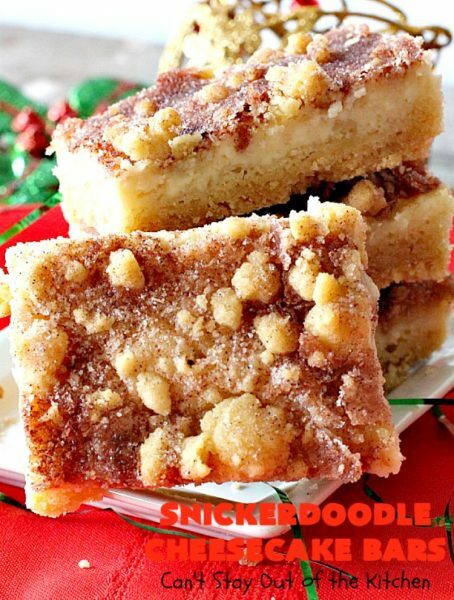 Yes, these fantastic bars are so drool worthy, every time you get a whiff of them you will be like Pavlov’s dogs–salivating! Seriously, these brownie-type cookies are everything you’ve ever dreamed of in a cookie. We baked thousands of cookies this year for our Christmas Cookie Extravaganza. This cookie was one of them – and boy did I ever get a lot of positive feedback about them. One gal in our neighborhood told me they were to die for! 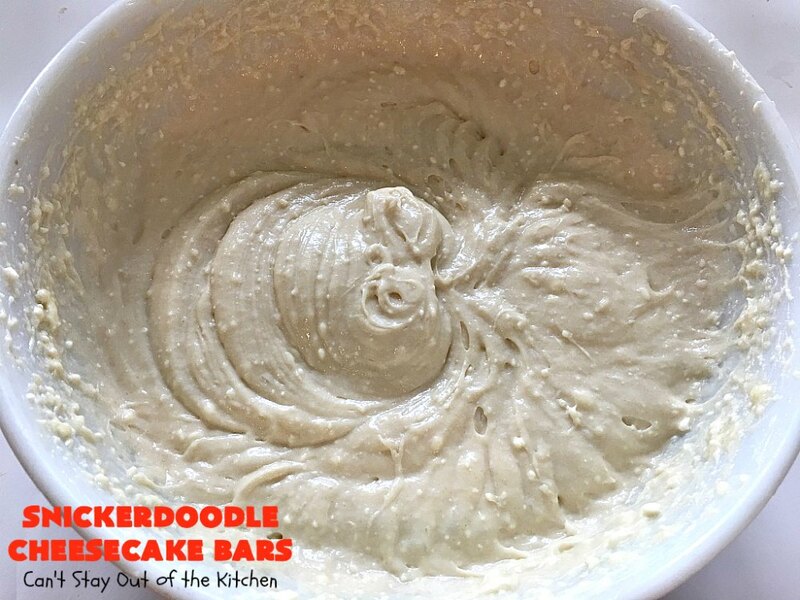 🙂 I personally thought they were all you could want in a cookie with a luscious cheesecake layer sandwiched between Snickerdoodle dough. They were awesome, indeed. 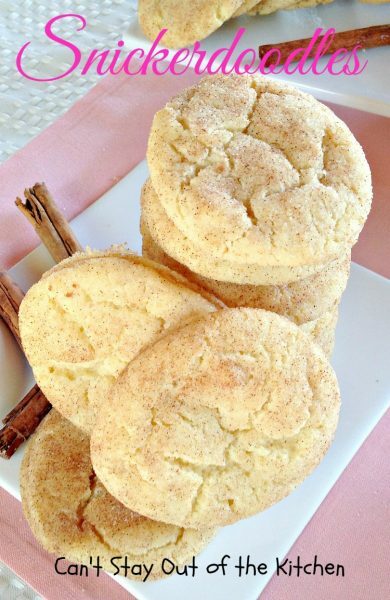 I love a good Snickerdoodle. I even have a peach version of this cookie. 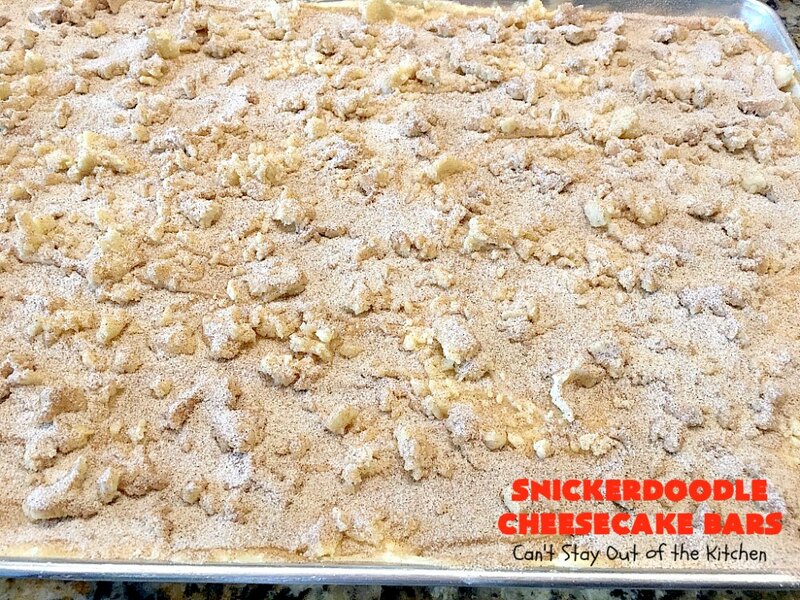 I have a fabulous Cinnamon Frosted Snickerdoodle Blondie with cinnamon chips in the dough. 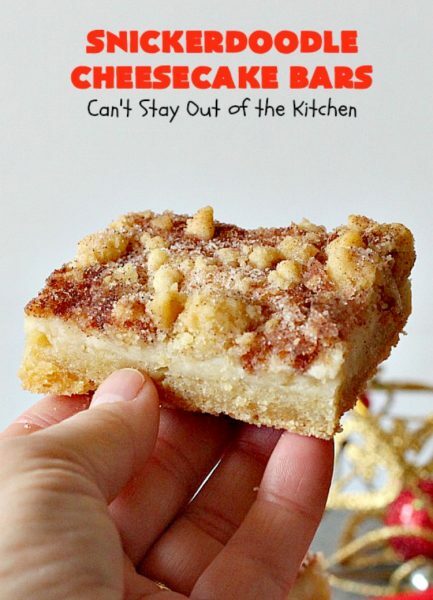 I also have a Snickerdoodle Blondie that’s glazed with icing that we love. I’ve made Snickerdoodles in muffins, cake and two kinds of bread. Did I say I love Snickerdoodles? Yes, yes, yes! I started with my original Snickerdoodles recipe. 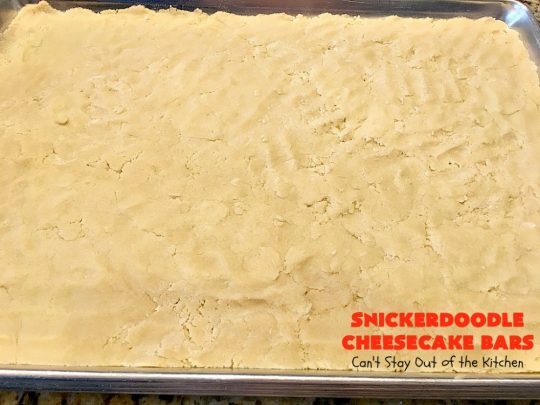 But rather than rolling the cookie dough in cinnamon sugar, I pressed part of the cookie dough (without cinnamon-sugar) in the bottom of a large baking sheet. Then I added a cheesecake layer, topped with the remaining Snickerdoodle dough. After that, I sprinkled a cinnamon-sugar mixture on top of everything. The cinnamon sugar baked into the crumble layer and the cheesecake layer so it was absolutely terrific. If you’re baking in a smaller cookie sheet or dish, you will have to adjust your time considerably. I would start checking after 35 minutes. Once a toothpick inserted in the center comes out clean, you should be good to go. 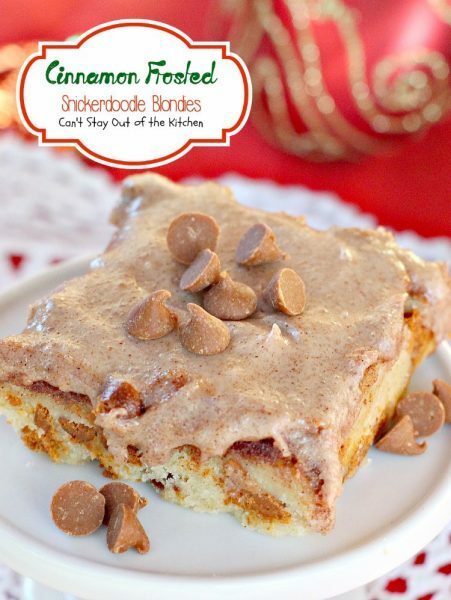 This recipe is a little more involved than a lot of cookie recipes, but it is soooo worth it. 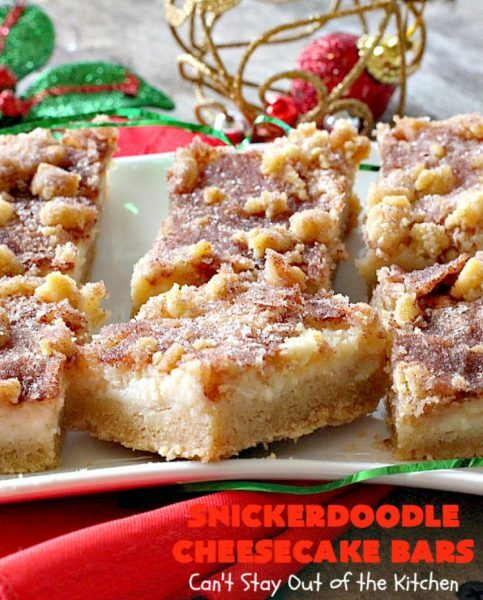 Give these cookies a try this holiday season and wow your family, friends, co-workers and neighbors with these delicious Snickerdoodle Cheesecake Bars. Don’t say I didn’t warn you. 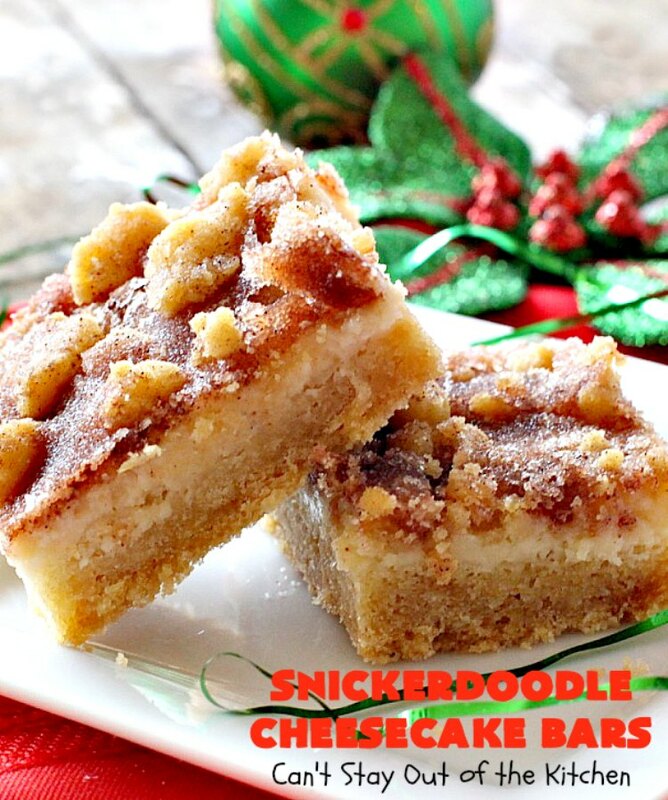 Everyone will drool over these bars and you’ll be lucky if you’re left with a smidgeon to eat. 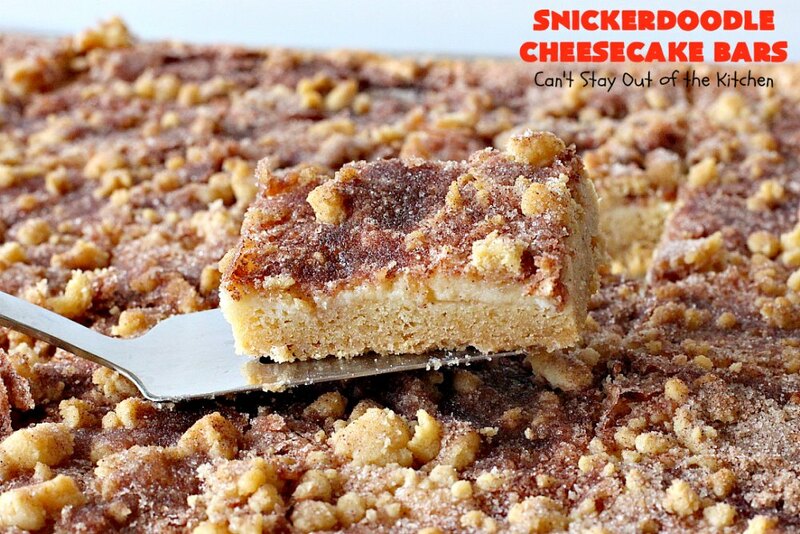 Snickerdoodle Cheesecake Bars are awesome. You will be salivating like Pavlov’s dogs over these scrumptious goodies. Every bite of Snickerdoodle Cheesecake Bars will have you drooling. 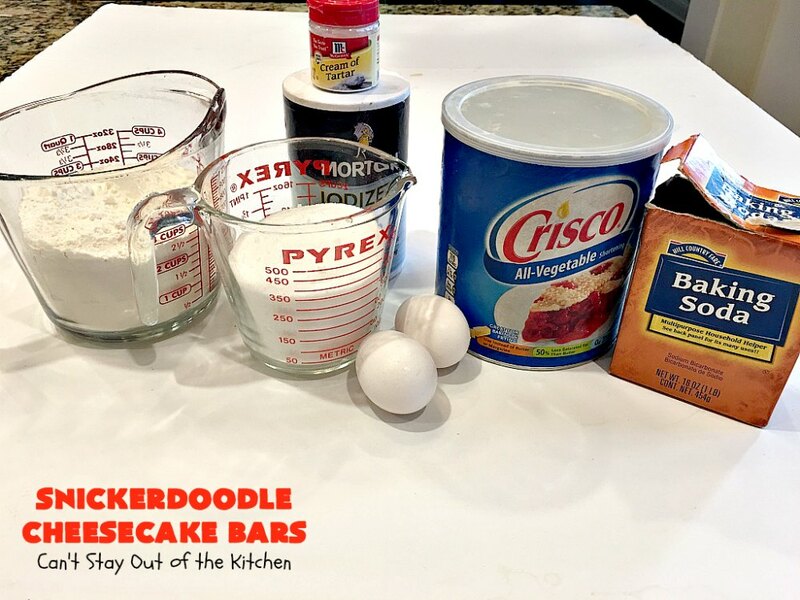 I used these ingredients for the Snickerdoodle layer. Don’t be overwhelmed by the ingredients. I made eight double batches or sixteen batches of the original recipe for my holiday baking this year. Place Crisco shortening in a mixing bowl. Add sugar, eggs, salt, baking powder and cream of tartar. Stir ingredients with a heavy spoon until very well combined. 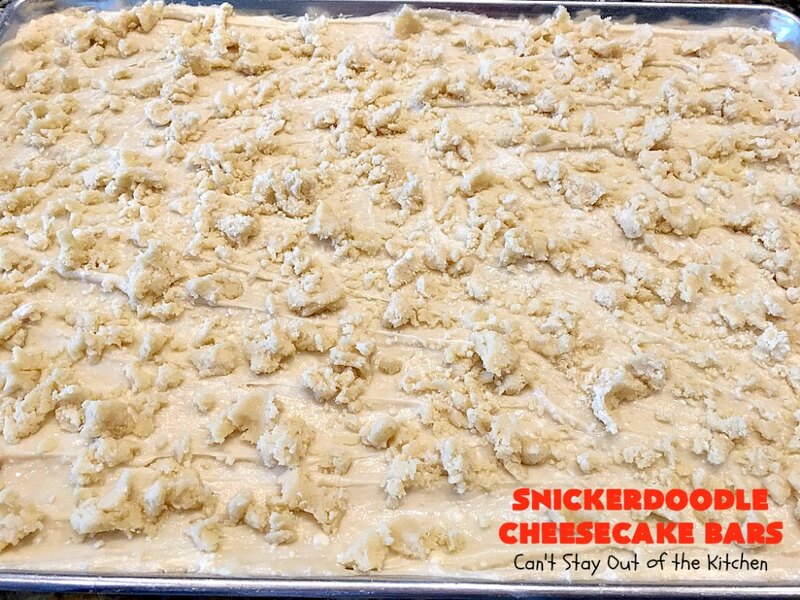 Spread between one-half and tw0-thirds of the cookie dough into the bottom of a greased 10×15″ cookie sheet. 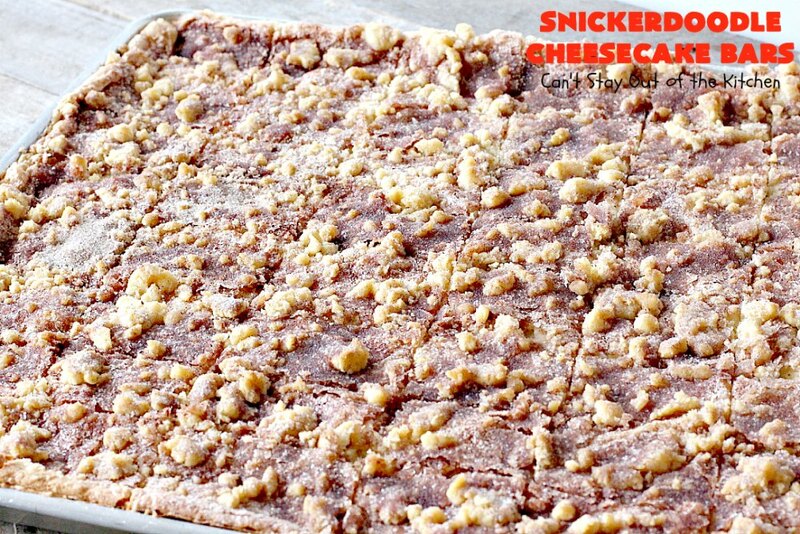 I spread this double batch into an 18×26″ cookie sheet. 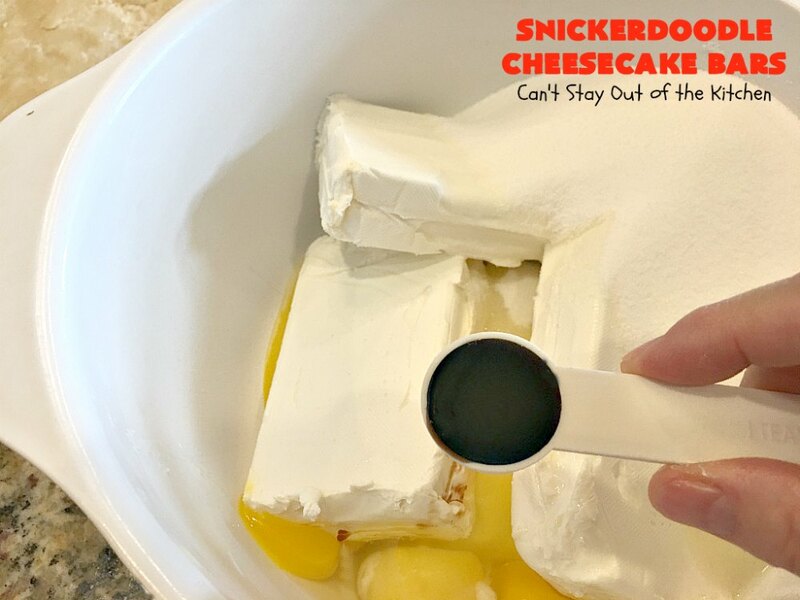 You can bake this in a 9×13″ glass baking dish but it will be deeper and cook differently than if you put it in a shallow pan. Next, make cheesecake layer: I used these ingredients to make the cheesecake layer. Cream with an electric mixer until mostly smooth. 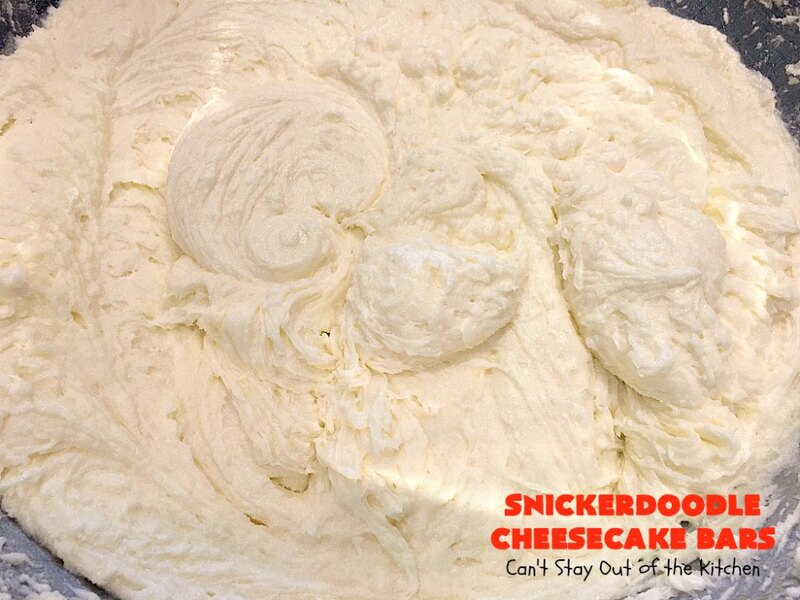 You may not get all of the cream cheese smoothed out unless your cream cheese is really soft. Don’t worry about it. 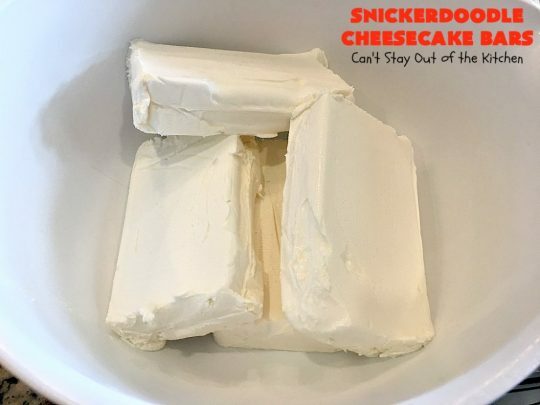 The cheese melts as it bakes in the oven and smooths out. Smooth the cream cheese layer over top of the Snickerdoodle crust. 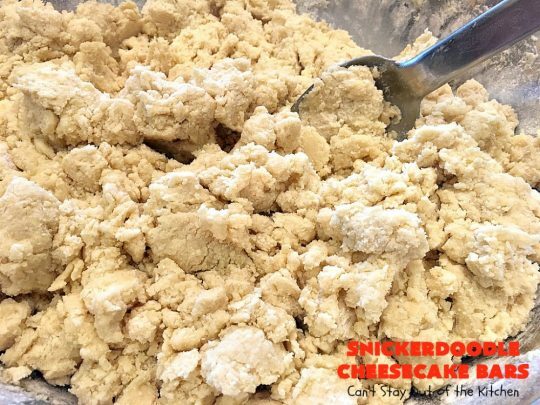 Crumble remaining Snickerdoodle dough over top of the cheesecake layer. 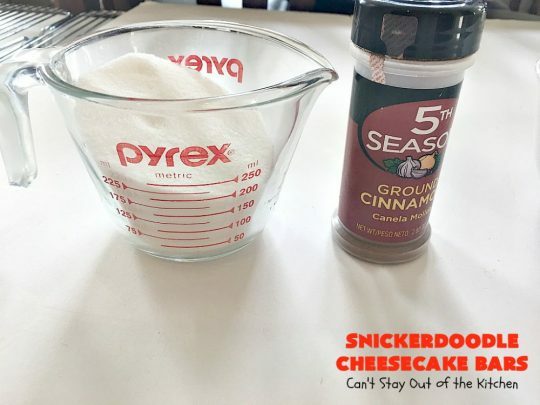 I used these ingredients for the cinnamon-sugar layer. 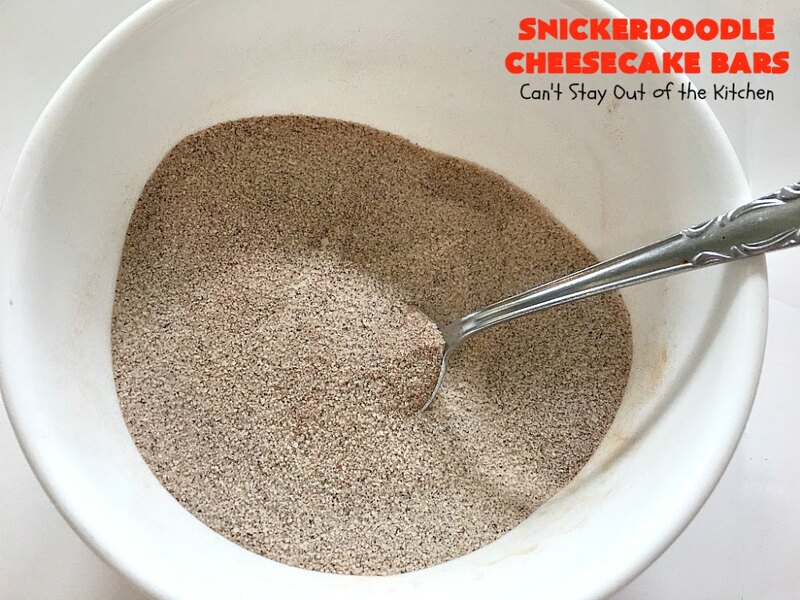 Sprinkle cinnamon-sugar mixture evenly over top of crumbled Snickerdoodle layer. Bake at 350. For a regular 10×15″ baking sheet, start checking after 30 minutes. When a toothpick inserted in center comes out clean, the cookie is done. 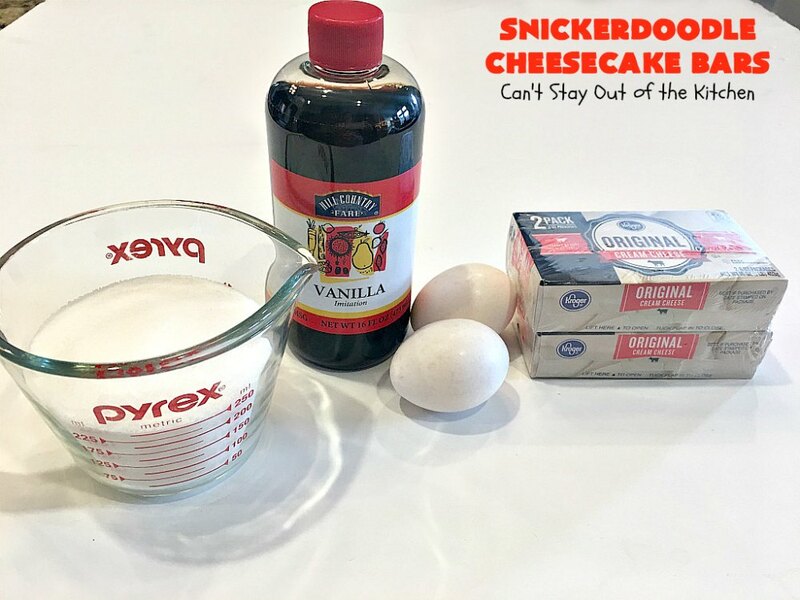 For a 9×13″ glass baking dish, the recipe may take 45-60 minutes. This was an 18×26″ cookie sheet and it took about one hour thirty minutes for these to be done. I baked four cookie sheets at a time and rotated the cookie sheets on the rack every 15 minutes. Allow cookies to cool completely before cutting into bars. Mine took over an hour to cool sufficiently. Snickerdoodle Cheesecake Bars have a luscious cheesecake layer in the middle that makes these cookies so rich and decadent. If you love Snickerdoodles, you’ll go over the moon after eating one of these addictive treats. 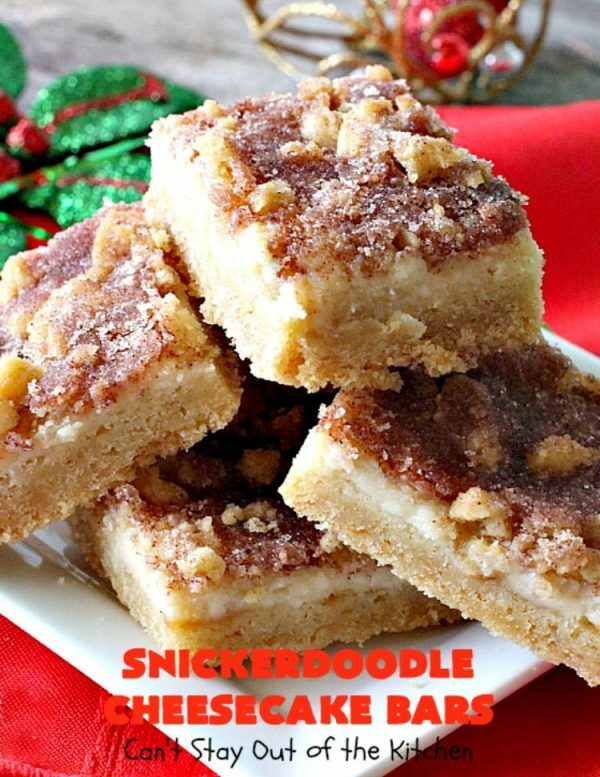 These amazing cookies have a Snickerdoodle layer, a cheesecake layer, a Snickerdoodle crumb topping and a cinnamon-sugar layer. 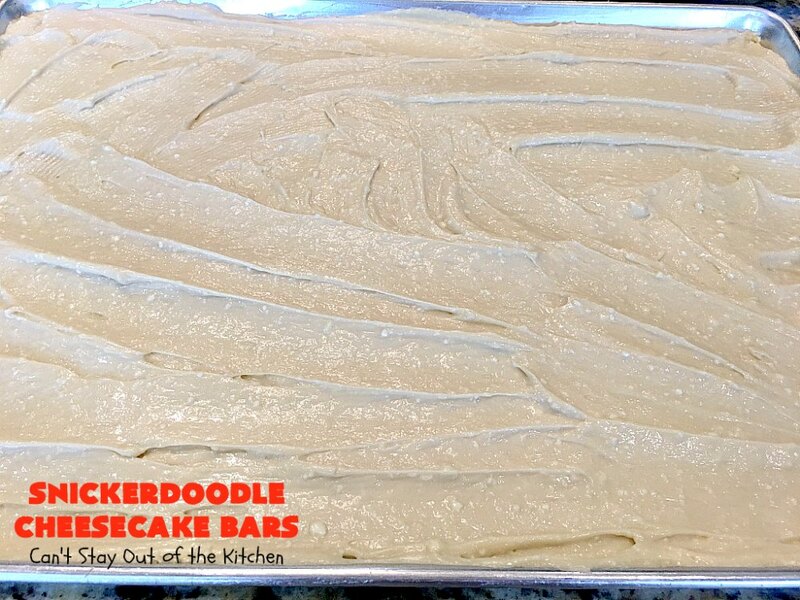 They are wonderful for holiday parties, tailgating, potlucks & birthdays! Cream shortening, sugar, eggs, baking soda, cream of tartar and salt, beating well. Add flour and stir with a wooden spoon. Press about one-half of the mixture into a greased 11x15” cookie sheet. 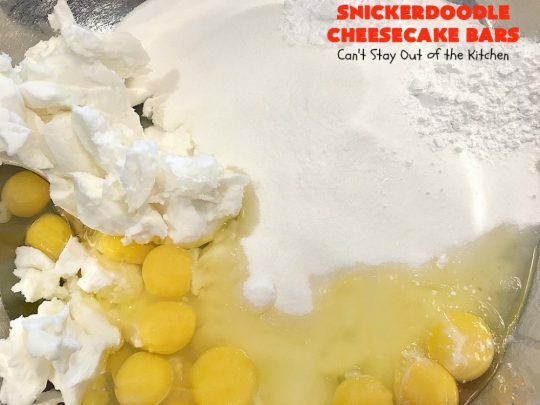 Top with cheesecake layer spreading to edges. 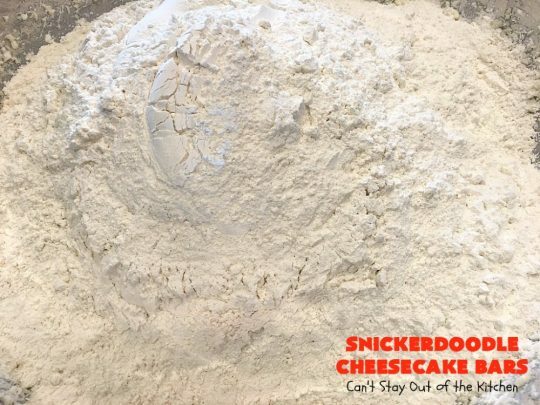 Sprinkle remaining Snickerdoodle mixture over top. Sprinkle cinnamon-sugar mixture over top of cookie dough. Bake at 350° about 45-60 minutes or until mixture is set and a toothpick inserted in center comes out clean. 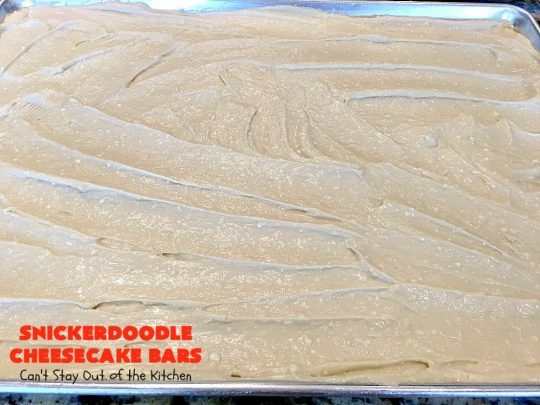 Allow bars to cool completely before cutting. Add eggs, vanilla and sugar and mix with an electric mixer until smooth. Pour over top of Snickerdoodle crust layer as directed above. Sprinkle over top of bars as directed above. 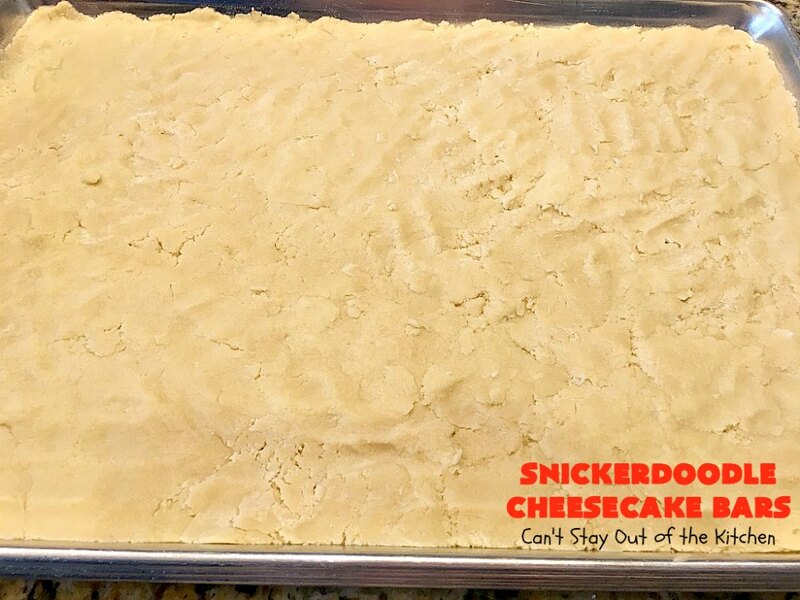 NOTE: A double batch fits into an 18x26” three-quarter sheet pan. NOTE: Because I was baking four 18x26” pans in my oven at once, my pans took over an hour and a half to bake completely. I rotated pans every 15 minutes while baking. NOTE: Since I did not bake this in an 11x15" cookie sheet or a 9x13" baking dish, you will have to guess on the exact time needed to bake these cookies. I would start checking after 30 minutes of baking time. A toothpick inserted in center should come out clean before cookies are completely baked. Cook in the center of the oven and if you have more than one pan, rotate racks every fifteen minutes while baking. 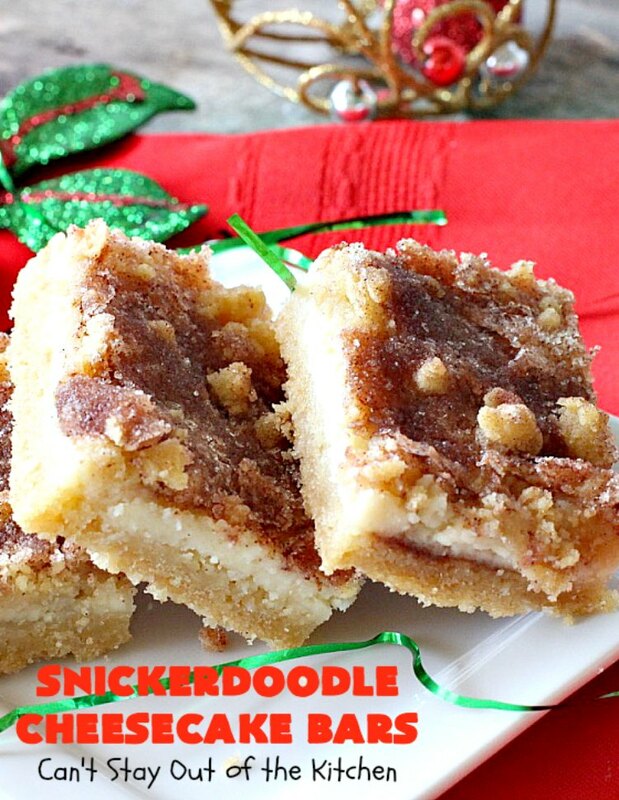 Snickerdoodle Cheesecake Bars are perfect for holiday parties, Christmas Cookie Exchanges and potlucks. Everyone will rave over them. These lovely brownie-type cookies are great for tailgating parties and birthdays, too. How long can these bars be left out, and do they need to stay refrigerated? Hi, Joanne. You can leave them out for several hours, but I would refrigerate them after that.